The Next Stage: Women and Retirement: From Fran Waksler: What Should I Read Next? Retirement has brought me an abundance of time to read, certainly a welcome luxury, but one consequence is my now more frequent search for what I will read next. I try very hard to choose a next book before I’ve finished the one I’m reading so I won’t have that uncomfortable bookless gap during which I wander the house looking for just the right one. As I wrote previously, I’ve been in the process of rearranging my bookshelves. Now I finally have space on the shelves of carefully alphabetized books I have read. I also have a place for unread books but, unfortunately, also have little outposts of them on various other shelves, interfering with my organizational plans. The solution I have come up with is to choose to read books that have been languishing on my unread shelves, neglected for no apparent reason except that the time to read them never seemed quite right. What pleasant surprises I’ve had, as well as some disappointments. As part of this new approach, I first read Sarah Grand’s The Beth Book, (Virago) that I think I was avoiding just because it was very long and I’d never heard of it before. I can’t even remember why I bought it. I chose it now because I wanted space on the shelf where it was resting. I found the first half very good, showing a knowledgeable and detailed grasp of a child’s perspective; the second half got rather preachy but still, overall it was a worthwhile read. I found it reminiscent of Wilkie Collins. The next book, chosen to make more room on my unread gardening bookshelf, was Elizabeth Lawrence’s The Gardener’s Essential Gertrude Jekyll, selections for Jekyll’s writings. Much to my surprise, I didn’t enjoy it and found it discouraging. Her goals for gardening are so lofty that she makes ordinary gardeners look stupid. I didn’t learn much of practical value. She raved about Funkia so I looked up their common name: Hostas—which I dislike intensely. 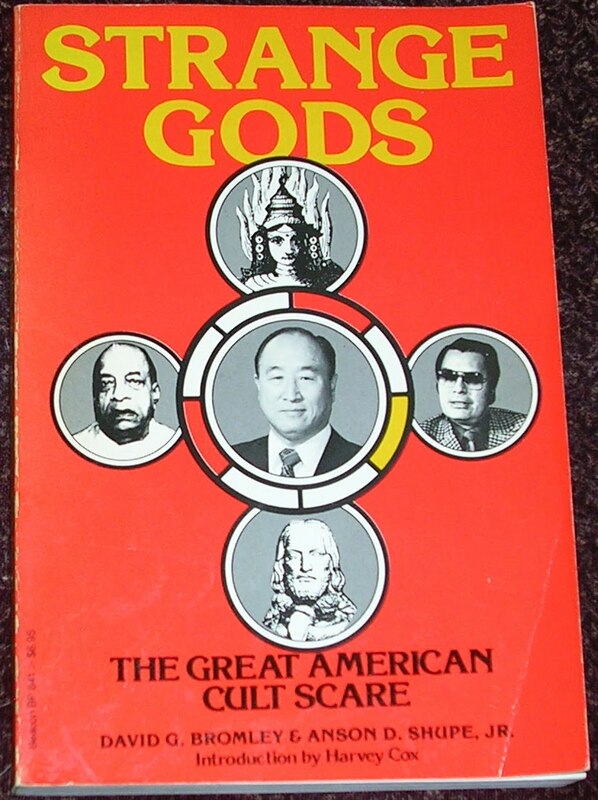 David G. Bromley and Anson D. Shupe, Jr.’s Strange Gods: The Great American Cult Scare (photo above), has been on my shelf for years and was close to being discarded a number of times. The bright orange cover and the artwork made it look like a sensationalist polemic. It turned out to be sociology at its best, with good description and sensible analysis of the way that the danger presented by cults has been exaggerated, primarily by distraught parents and deprogrammers with help from the media. It describes the dangers to religious freedom of dismissing and even persecuting cults and recognizes that many traditional religions began as cults. I wanted something short and chose Florida Scott-Maxwell’s The Measure of My Days, which I expected to be interesting musings on growing old. I can’t say that it captured me at all and didn’t make much room in the bookcase. Another shelf where I wanted a bit of room held Rebecca Stott’s Darwin and the Barnacle, a gift from my husband who knows of my interest in Darwin and in arguments over evolution. I can always trust the books he chooses; they are guaranteed to be well written. This book was a particular pleasure, showing Darwin as an exceedingly careful and hard-working researcher. He spent years at his microscope tracing the evolution of barnacles, knowledge that was fundamental to his theories later published in The Origin of Species. I realize that in some ways I have been a lazy book-chooser, relying on familiar authors and topics and not taking chances. But I acquired the unread books on my shelves for some reason; perhaps I should trust what I chose even if I don’t remember why. It's good to read an article sometimes.